Makki di rotti te saron da saag, this is how the humble peasant food of Punjab is called. Sarson ka saag makki ki roti is one classic combination that defines how the special food was always defined by the best of the season. 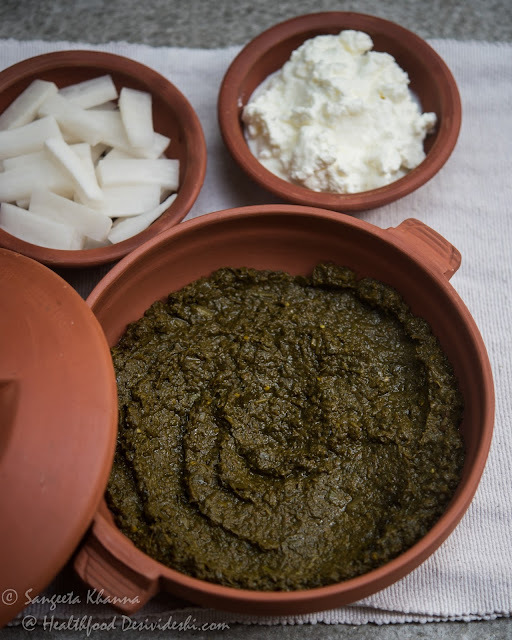 Making maaki ki roti and sarson ka saag used to be a ceremony in every home and it still is, most people now make one large batch of sarson ka saag for the whole season and freeze it in batches. Thawing the sarson ka saag, refreshing it with some hot tadka and fresh white butter and some freshly made makki ki roti makes a soulful meal even in modern times. Those who have a big time crunch can get half cooked makki ki roti made in bulk and reheat it over gas flame whenever serving. If there is a will there is a way and we do it for some of the special meals. Makki ki roti and sarson ka saag is one of them. Making the saag is quite time consuming. It is advisable to wash and clean the leafy greens in advance, boil them with the initial ingredients in large batch and freeze it for future use. Thereafter your job will be easier whenever you want this for lunch or dinner. Mix everything with 1.5 cup of water and pressure cook with salt to taste. I prefer to pressure cook for 10 minutes after the first whistle. Blend this mixture. I prefer a coarse textured saag so I blend it coarsely, you can blend it smooth if you want the other way. After this the saag can be freezed in portions for later use, tempering with the tadka whenever required. For the tadka, heat mustard oil or ghee in a kadhai and throw in some cumin seeds and coriander seeds (must use this), Then add some coarsely ground onion, ginger,garlic and green chilies, stir fry till cooked but no need to brown them. Add the everyday curry powder, a generous pinch of garam masala and fry till the spices get aromatic, sprinkling some water in between to prevent the mixture from burning. Make a coarse paste of fresh tomatoes and add to the frying mixture, add salt and fry till the tomatoes get cooked. The cooked mixture looks reddish brown. Add red chilly powder if you like it hot. I don't add red chili powder normally. Some times I add boiled peas at this stage. Now the coarse paste of the saag goes in, mix well and let it simmer for 5 minutes. 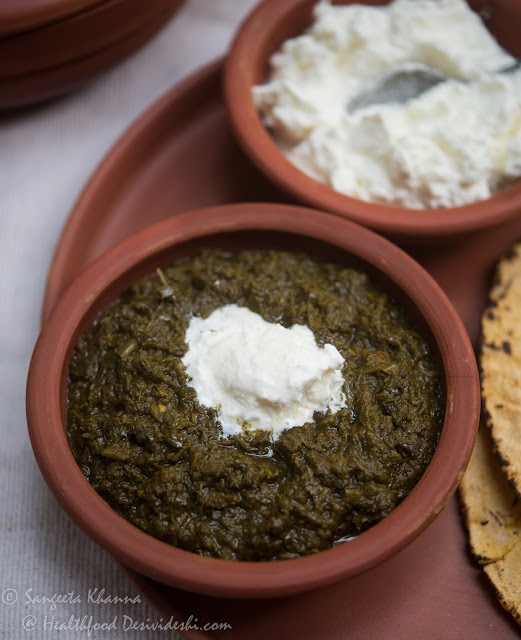 A little bit of roasted and powdered kassori methi makes the saag very aromatic. Add it and let the saag be covered for a few minutes, off heat, before serving. Note that the proportion of the spices, onion, garlic, ginger and chillies etc for the tadka depends on individual taste. The tadka can be really light or medium spicy as per taste but take care not to add too much spices and drown the taste of the sarson ka saag. Topped with white butter and piping hot, this is how the sarson ka saag is served and it becomes soul food for everyone who is blessed by it. Yes it is such a special food of the season. Makki ki roti on the side, white butter melting teasingly. Many people can't imagine makki ki roti without butter, but I like it both ways, with butter or without it. 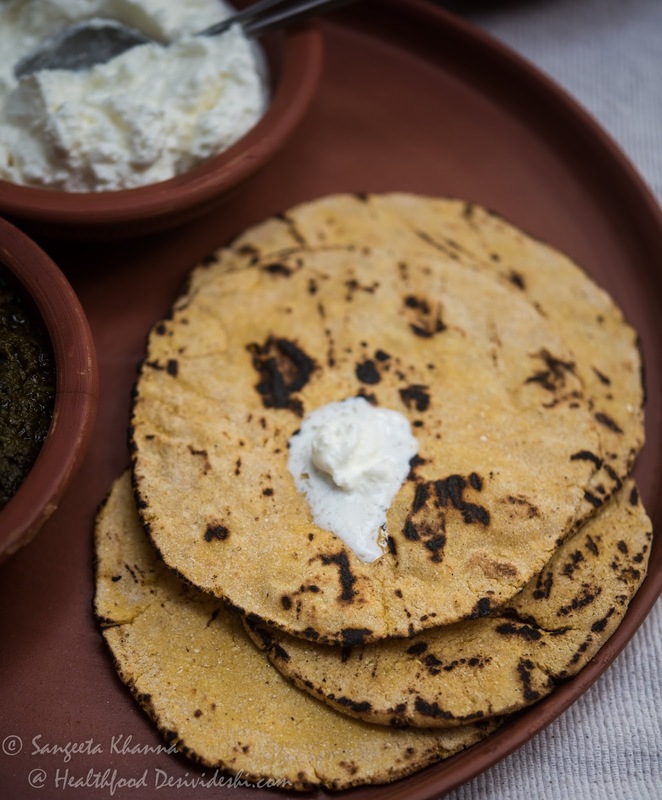 Once we have white butter in the saag you really don't need much for the makki ki roti but these special meals are indulgent type for many of us. Go with the flow when eating best of the season I say. If you don't have the luxury of white butter you can have it with regular butter too. But making white butter in a small batch is not too difficult and it takes only about 5 minutes to make a bowl of white butter. See how to make white butter at home. 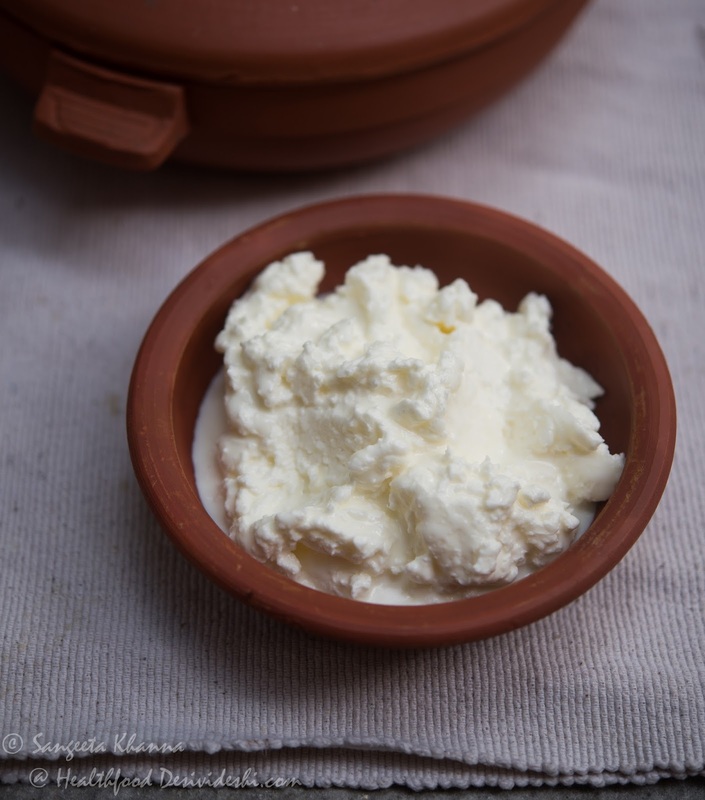 Making ghee at home from the same butter is easy too. White butter transforms such meals so it is worth investing some time in it. As I said and you all know for sure, making the makki ki roti is a matter of practice. With the right instructions, the task becomes workable though. I have shared an easier way to make makki ki roti with some added oats too. The instructions with my tips are here to follow if you are making regular makki ki roti. Mix well using all fingers, knead with a rubbing motion so that the dough becomes soft. The corn dough has less pliability so it helps to rub it more so that the dough starts binding as you rub. Add more water if needed, it takes more water than wheat flour, the dough becomes smoother and softer. Use the rolling pin to roll the roti with soft hands, not a very smooth edge but that is fine. My mother used to make perfectly smooth rotis with makki ka atta. This roti is a bit thicker than wheat chapati, some people can make it very thin too but don't worry if you can't make it thin. It tastes as good if cooked well. Lift the roti quickly and flip on hot griddle. Cook both sides before cooking it directly on flame. Serve hot with butter or without it. This platter of makki ki roti and sarson ka saag has brought many complements to me, many emotional ones too. This kind of food brings back memories nostalgia and a pure sense of contentment. Making makki ki roti and sarson ka saag at home is always like a great indulgence for me. I love it. Missing my mom and her makki ki roti. Hi anon....Thanks for following my recipe and for the feedback. We actually mhad makki ki roti with gur and ghee as a dessert today after a dinner of makki ki roti with beet root greens saag . It was awesome , will post about that too . Bajre ki roti is made the same way too , knead with hot water and roll the same way. Simply perfect combo and done it so well. Hi Nirupama .. The suji like corn corn rawa will be difficult to roll into rotis , you can try running the corn rawa in your mixie for a while , it should work. And if you find rolling difficult , you can use a polythese sheet to roll . Also , some people mix some whole wheat atta to the cornmeal for easy rolling of the roti , you can try this way with your corn rawa... 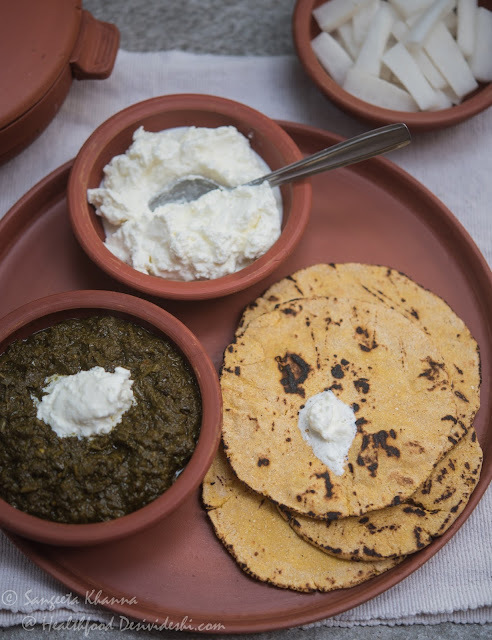 I am posting a beet greens saag to go with makki ki roti , try that if you don't get sarson ka saag ...paalak paneer is also a great accompaniment to this roti. Kneading with hot water...this I did not know,i used plain water.And makai ki roti is awesome anytime not just winter.i have often made rajma to go with it,sometimes even mexican style,when they became burritos!! !Must try your combo soon,even if winter is well out of the window in my part of the world! The Sarson Ka Saag recipe is awesome. I tried it and turned out delicious.